Busy day. Up early to Traverse City and hiking in the trails behind the Grand Traverse Commons, the incredible project on the grounds of what used to be the old Northern Michigan Mental Asylum, some 135 acres that are being turned into a small new-style city – a city within Traverse City. Then it was shopping for a hat for me at Diversions, a hat store, since I found I had left mine at home and we would be out in the sun for hours. On to the great Oriyana Food Coop, said to be the largest community-owned natural food coop east of the Mississippi River. Then it was lunch at the Om Café, a macrobiotic restaurant. Are we having fun yet? After lunch we went tried to take a short nap in the car which was not very successful, and then on to my daughter May's (and her husband Seth's) house to take care of my five-month-old granddaughter Iris, while the musicians went through their music set preparing to open for Lyle Lovett and His Large Band at the Flintfields Horse Park just outside of Traverse City. Before we knew it we were caravanning to the music site, being badged and waved through security where four mammoth tents and other stuff was up and wating. 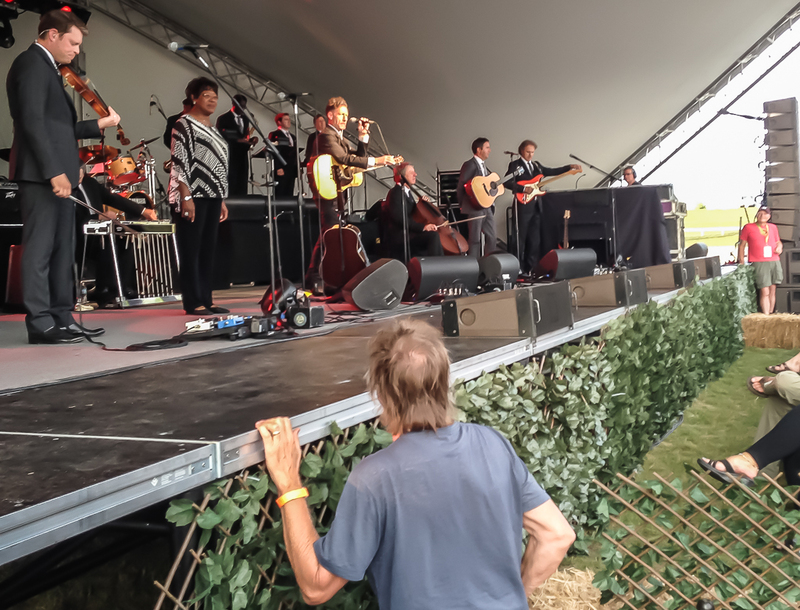 And, sure enough, there was Lyle Lovett walking around behind stage for some hours. He was probably happy to get out of the three huge tour buses (and two semi-trailers) he brought with him. Lovett was traveling as part of a group of 136 people, and folks, that is a lot of musicians and crew. He was wearing jeans, and had spurts on. He had been riding horses before we got there. Lovett was walking around backstage with a big camera rig (it looked like a Canon system) taking pictures, including taking a shot of Margaret with baby Iris. Thanks to our friend and entrepreneur Sam Porter (who was putting on this huge concert) Margaret and I had all-access passes and we, along with baby Iris, wandered around for a while, and finally set up our little camp in an alcove where the sides of two dressing-room tents came together. We spread a blanket on the ground and there we sat, only thirty or forty feet from where Seth and May would perform. May and Seth open for Lovett before a sea of people and they sounded great. During the first twenty minutes or so, Iris, who could hear he mom singing as she lay on her back, sang along, wiggling her legs and arms and letting out little squeals of joy. She and I had a lot of laughs together. And so it went. There was great backstage food, and Lyle Lovett put on a wonderful concert for over two hours. Margaret and I had seen Lovett live twice before. Anyway it was fun. What was not so fun was driving the two hours home rather late and in the dark after the concert. But we made it and I needed to be here because another of my grandkids, my two-year-old granddaughter Emma would be at our home and expecting to find grandpa in his office when she runs over early in Sunday morning. Emma just moved out of an apartment into a new home in Ann Arbor with her mom and dad. Her mom tells me Emma asked if grandma and grandpa would be there when they moved in. How sweet. Anyway, I will be reading stories and doing who-knows-what with Emma today. And Sunday we have a long drive up north to yet another festival to babysit Iris where May and Seth are performing. So that's my story and I'm sticking to it.